Board Members and Mangers often work tirelessly with very little appreciation, but you have an opportunity to change that! Nominate your favorite Board Member or Manager that has gone above and beyond the call of duty for your Association. The 3rd Quarter "Most Awesome" nomination deadline is Friday, July 20, 2018. We are proud to present Patricia Rowe with our 2nd Quarter Most Awesome Manager Award! Patricia was nominated for this award by Jill Duckworth Board Secretary at the Four Seasons Condominiums. Jill convinced of us of Patricia’s Awesomeness saying: “Patty takes great pride in her work. She is always willing to go the extra mile to assure that the property is safe and well-maintained. She is pleasant and has exceptional people skills allowing her to communicate effectively with vendors, owners, tenants, board members, and maintenance. Patty is well-organized and her ability to maximize time management allows her to successfully address the never-ending issues of a property this size. She is truly an important asset to our community.” Due to this, and many other accounts and anecdotes about Patricia we had no problems selecting her as our 2nd Quarter Most Awesome Manager! Congratulations Pat! 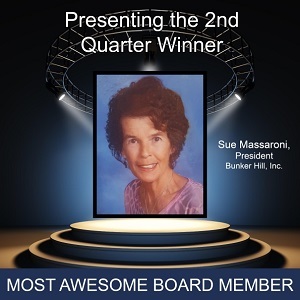 Sue Massaroni, President at Bunker Hill, Inc.
Our 2nd Quarter Most Awesome Board Member Sue Massaroni made an impression on Patricia Kincaid, Vice President at Bunker Hill, Inc. Patricia Kincaid had this to say in her nomination of Sue: “Sue Massaroni goes out of her way to help and council all of the residents of Bunker Hill Condos. This is her second year as President and is hands down the sweetest, most efficient and knowledgeable Board President. She knows all of the "dos and don'ts" and is always ready with an answer to any board or condo-related question. She makes herself available to us and is never afraid to get her hands dirty when necessary. Every resident knows that he/she can rely on her at any time. She is always positive with a "can-do" attitude. 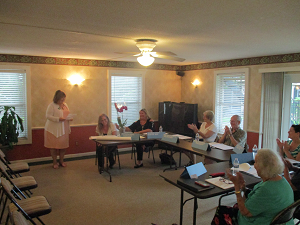 Each member of the Condo Association is important to her no matter how serious or frivolous the subject matter.” For these reasons, we selected Sue Massaroni as one of the Most Awesome Board Members in Florida. Congratulations Sue!